There is plenty of evidence that outdoor activity is a tonic for the senses. But keen proponents of arboreal and aquatic pursuits claim they are good for the body, too. By Jeremy Torr. Tokyo, London. February 8, 2019. According to the website, the phrase Shinrin-yoku was coined in Japan during the 1980s. Directly translated at “bathing in the forest,” its ideology revolves around the concept of immersion; immersion in living nature, and wooded areas in particular. “The idea is simple,” it says. “If a person visits a natural area and walks in a relaxed way, there are calming and restorative benefits to be achieved.” That’s nothing newsworthy to bushwalkers – but Tomohide Akiyama, director of Japan’s forestry agency who first came up with the idea says that the benefits go further than just being calm. The Shinrin-yoku site claims the healing effects of simply being in wild and natural areas extend to boosted immune system functioning, reduced blood pressure, increased ability to focus, accelerated recovery from surgery or illness, higher energy levels and improved sleep patterns. Even better, it can help with “the deepening of friendships” if you do it regularly. Miyazaki Yoshifumi has led research into shinrin-yoku for many years now, and has directly linked natural environments to wellbeing. Courtesy YouTube. Yoshifumi reckons that a dip into the forest helps take us back where we know we instinctively belong, and that leads to a reduction in stress, which in turn means we can recover our immune strength and develop bodies more resistant to illness. “At the end of the day this will lead to a reduction in medical costs,” he says. It should do: Japanese researchers have spent over $4 million on investigating shinrin-yoku at Chiba University and Nippon Medical School in Tokyo. To date, research has found quantifiable evidence that walking in the forest resulted in 13.4% less cortisol (stress hormone) in the bloodstream when compared to a similar walk in the city. They also discovered that on average, blood pressure dropped by about 1.5%, and heart rate dropped by around 6%. So bathing in the forest sounds like it’s good for you, in more ways than one. But fans of therapeutic immersion don’t stop at the forest; they say that lakes and freshwater ponds can do the trick too. In London, the Serpentine Club swims in the freshwater lake in Hyde Park, strictly regulated since the 1830s. Members can swim in the lake in the mornings from 05:00 to 09:30. As the club tersely notes, “wetsuits are not permitted for the races” even on the Christmas Day Race. 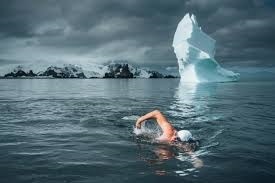 Environmentalist Lewis Pugh swims with polar bears - and icebergs. Courtesy Lewis Pugh. In the early days of the Club this was probably because the Empire needed to harden up its young people to subdue the inferior races, but there is some hard evidence that a plunge into icy water can help with today’s social demands including things like depression and anxiety. “When I first went cold water swimming, I came out and walked up the beach, and thought, wow – this feels good!” says Dr Mark Harper, a researcher at Brighton and Sussex University Hospitals and at the Extreme Environments Laboratory in Portsmouth, UK. Spurred by his own experience, Dr Harper dug deeper into the effects of cold, open water swimming and found significant anti-inflammatory effects for cold water, as well as sustained and gradual reductions in the symptoms of depression. In one experiment, his team worked with a withdrawn, depressed young woman who had been on antidepressants for eight years. The team wanted to assess the results of open water swimming on her condition, says Harper. “We took her swimming in a lake, and that withdrawn person was transformed into a happy, smiley, buzzy person,” he says. “Within four months she was consistently swimming outdoors – and off antidepressants.” Harper is not the only one to rave about open water swimming as a tonic for the body. Vladimir Putin takes a dip in freezing water. Courtesy Xinhua. Vladimir Putin is another keen cold water devotee, even taking the ice in midwinter on TV to prove the fact that he is fit enough to govern the world’s second biggest superpower. And environmental campaigner Lewis Pugh is convinced that cold water swimming helps him understand what other cold water animals are going through as their habitat shrinks. Researchers at the Institute of Biochemistry Humboldt University, Berlin, also reported that regular cold water dips help produce a drastic decrease in plasma uric acid concentration, and a corresponding rise in a swimmer’s antioxidant glutathione. That’s good for reducing heart disease. But some of the keenest proponents of open cold water swimming are found in London, at the Hampstead Ponds Swimming Club. People have been braving the cold wet here for some 200 years, and although there are plenty of young people in the water on any day, hot or cold, there are plenty of advertisements for the benefits of cold, open water swimming on the active life of humans.